Born In Berthoud Jan 26, 1925 Don attended his High School in Arvada and he graduated High School in 1943. 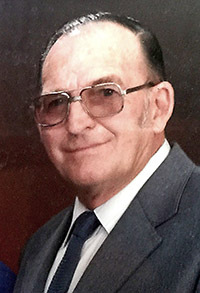 After graduating, he and his family moved back to Berthoud until he joined the Army in 1944, where he served in WWII as a truck driver from 1944 – 1946. He was one of the first to land on the island of Japan with the 41st infantry, after the bombing of Hiroshima on August 6th, 1945. Upon his return from the Army, he moved back to his hometown of Berthoud where he met his beautiful soul mate Laurene Yeager and married her on June 1st, 1947. (They were married for 68 wonderful years). He is survived by his daughter, Donna Lee Jones-Hoeft (Brookings, Oregon), and her children Laurie Idell Broughton-Rylands (Sparks, Nevada), Donald (Dobie) Broughton (whom Don and Laurene both lovingly raised from age 7 (Aurora, Colorado), and Ronald Shannon Wagner (Berthoud), as well as seven Great Grandchildren and four Great-Great Grandchildren. Don became a volunteer firefighter in Berthoud in 1948, and eventually became Fire Chief and served in that capacity for many years. He retired with 25 years of service, serving from 1948 – 1973. (At the time of his death, he was the oldest living Volunteer Firefighter in Berthoud). In 1963, he started his own business as the owner of Berthoud Oil Company with Enco/Exxon from 1963 – 1986. During that time, he delivered gas and oil to farmers of Berthoud, Johnstown, Milliken, Mead and Longmont areas. He owned 2 bulk plants, and 2 gas stations as well. He was a very well known, and well respected pillar of the community, and many people still know and respect him to this day. As a person, Don was extremely innovative and self-taught in many disciplines such as carpentry, masonry, mechanics, etc. He utilized those skills in his everyday life. At 30 years old, he skillfully built his own home on Bimson Ave from 1955-1956 with his wife Laurene and young daughter Donna (11 years old at the time), of which he quarried his own red-rock for his fireplace from Carter Lake. He made his own cinder blocks for the walls of the garage and cement for the foundations of both the garage and house out of the sand which he collected from the Little Thompson River, and lived there with Laurene until this very day. He also notably built his own pontoon boat out of 55 gallon oil drums, parts from an old gas pump and other misc. parts that he managed to find, and that was the most sea worthy boat on any lake. There were a couple times, during strong storms where he had actually pulled in and rescued 3 different boats that were disabled during those storms. Don loved spending every bit of his free time with his family, and his hobbies were building and flying model airplanes, fishing, camping, and going on family vacations every summer. He suffered with Alzheimer’s disease for about 4 years, and was laid to rest on September 15, 2015. Funeral Services will be held at 1:00 p.m., Friday, September 18, 2015 at Kibbey-Fishburn Funeral Home. Visitation will take place from 3-5:00 p.m., Thursday and prior to the service on Friday. Interment will be in Greenlawn Cemetery in Berthoud. Memorial contributions may be made to the Berthoud Fire Department or to Immanuel Lutheran Church in care of Kibbey-Fishburn Funeral Home. Site contents copyright © 2019 Recorder Online	except as noted. All rights reserved. | 90 queries in 2.388 seconds.